Register now for 9th Annual Great Bay Scallop Search! What To Bring: Able-bodied swimmers with sunscreen, hat, sunglasses, dive gloves, mask, snorkel, fins, and water shoes. Weight belt optional, but recommended. BOATERS....we need you! Non-boaters will be placed on boats as space permits*. Sign Up Today! Boaters interested in searching the northern bay can pick up equipment at Coquina Beach, 1800 Gulf Dr N, Bradenton Beach, FL prior to the event, Sarasota Bay Watch will announce date. • Captains' meeting is at 8:30 a.m.
• Scallop search begins at 9:00 a.m. sharp and ends around 12:30 p.m.
• Complimentary lunch following search, 12:30 p.m.
*We will attempt to get those without boats onto vessels, space permitting. PRE-REGISTRATION IS REQUIRED! This event fills to capacity every year. Register now! 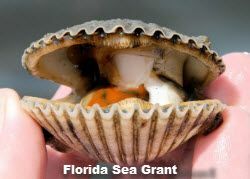 HISTORY: Scallops have been largely absent from Sarasota Bay waters since the 1960s due to dredging and land development (See: the Florida Land Rush), the accompanying population boom and associated water quality issues. Today there have been improvements in water quality and a resurgence of seagrass beds to levels that may once again support these important bivalves in Sarasota Bay.